Today I found out that all humans can be traced back to a single female known as Mitochondrial Eve. This woman is thought to be the “mother” of all humans alive today. Seems like a big claim for scientists to make. So how do they know this? The simple explanation is that when an egg is fertilized by a sperm, the DNA from the father and mother join together in a process known as recombination. Certain DNA is only passed down from the mother or father. All mitochondrial DNA (mtDNA) come exclusively from the mother, as an exact copy. Over time however, there will occur predictable mutations to mtDNA. Biologists can compare samples from individuals to determine how closely they are related- the fewer these predictable mutations, the closer the relationship. The predictability of these mutations also allows biologists to estimate the time at which a certain mutation (i.e. ancestor) lived. Beginning in 1987, several studies have been conducted that show all humans alive today have the same female ancestor and she lived approximately 200,000 years ago. A more detailed explanation is as follows. Mitochondria are a type of organelle found in almost all complex cells. They are known as the power plants of the cell because they supply an enzyme (more accurately a co-enzyme) known as adenosine triphosphate (ATP). This ATP is the source for the chemical energy needed by a cell to perform a wide range of functions. The DNA found within mitochondria have two benefits. They have 37 genes that rarely mutate, so they can be easily used as the model for an evolutionary clock, and these same genes have subsections that mutate in a predictable manner so biologists can use it as a reference for age. Sperm have only a few mitochondria (and thus mitochondrial DNA) in their tails. They use them to power their quest to the egg. As the sperm enters the egg, only the chromosomes found in the head of the sperm are preserved and used in the recombination process to create new cells. This is because the rest of the sperm cell is broken down by enzymes within the egg. So the mitochondrial DNA in the tail is lost and the only type to survive is supplied by the mother. As the human population grows from one generation to the next, women transfer this DNA evidence to their daughters. They, in turn, transfer it to their daughters. Should a woman have only a son, their mtDNA is lost, because it will never be passed to his children. However, there have been a few rare cases in which mitochondrial DNA was found recombined from both parents. Some skeptics of the Mitochondrial Eve theory use this to cast doubt on the hypothesis. This opposition is somewhat dubious as those few cases occur in people who are typically far too biologically deficient to have offspring. Thus, the prevailing assumption is that these unfortunate people have something seriously wrong with their DNA and the abnormal recombination of mtDNA will never get into the human population because of it. Even though biologists have shown that all people are descended from one person, this does not mean that only one female was alive at that time. It simply means only one set of genes have been passed down from a single point in history. 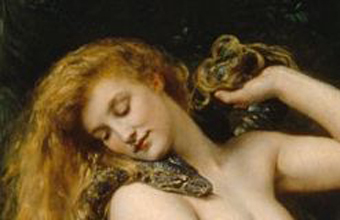 Most researchers agree that “Eve” was not the only women alive because the fossil record shows much older specimens. From “Java man” at about 800,000 years to “Lucy”, the earliest known remains which are approximately 1-4 million years old. There are several theories about how just one set of genes could have survived. The most likely is a bottleneck of the human population that would set the stage for an evolutionary “lucky mother”. There have been several possible bottlenecks in history. One report, written in 1998, showed approximately 70,000 years ago humanity was down to around 15,000 people. It showed the reason behind the bottleneck was an ice age that lasted about a 1,000 years. Other reasons bottlenecks could have happened are: an asteroid impact or volcanic eruption causing drastic climate change; a continuous, widespread plague; or any situation that caused male offspring to have a better chance of survival, leaving relatively few women around to pass on their genes. While no definitive proof exists that these occurred, most researchers believe a combination of one or all of these factors are behind why we all have a common ancestor. There is another type of genetic test that can trace all humans alive today back through their father’s ancestors. This uses what is known as the Y chromosome and shows that all people today can trace their lineage back to a single father known as “Y Chromosome Adam”. Before you start throwing fuel on any religious fire, Y Adam lived at a completely different time then Eve. Approximately 60,000 -90,000 years ago. How can this be? Mitochondrial Eve is simply the most recent common ancestor of mtDNA. Y chromosomal Adam is the most recent common ancestor for Y DNA. They did not have to be a couple for both of their genes to be the source for all current humans. Think of it this way; you have two rivers flowing down two separate mountains joined at the bottom. We’ll call Mitochondrial Eve, “Mountain A”. We’ll call Y Adam, “Mountain B”. The rivers will be their respective genetic lines. As they cross paths at the bottom, the joined rivers create a bigger river that itself splits off into countless streams that is humanity today. Mountain A could be a thousand times older then mountain B. What matters is the point at which they crossed created all the streams (people) that exist down hill from that point. It would also not matter how many times Eve’s river split before it crossed with Adams, it only matters that they crossed and the only streams to survive came from both mountains. There is an obvious disparity between the approximate age of Mitochondrial Eve and Y Chromosome Adam and the current fossil record. Because of this, there is a very heated debate between geneticists and paleoanthropologists about the true origins of human kind. The only thing they all seem to agree on is that all humans descended out of Africa at some point in history. There is actually black people in africa whos genetics are also more similar to our ancestors. Which just adds to the out of africa theory. I don’t get the jokes at the end. Can someone explain the jokes? but they only had plants to cover their genetelia as you see in pictures so she says i’ll be wearing the plants , haha … yeah. @random: You are quoting papers from 2013. This article was written in early 2012 and published in late 2012. NICE WRITE SCOTT. KEEP THEM FLOWING. That one woman would not be Eve, she would be the wife of Noah. Everyone alive would have to have been related to her–but none of her predecessors or contemporaries would have survived her. Sorry CrazedLeper but Noah’s wife could not be Mitochondrial Eve. Noah’s sons brought their wives along. Baring her having an unmentioned incestuous daughter (possible, this is the bible after all) none of her mitochondrial DNA would have propagated. Better claim would have been for Noah as “Y Chromosome Adam”. His son’s would have had his Y and so would everyone else. Whether it was Noah’s wife or Noah’s daughters-in-law, the story means the same – those women also were descendants of the first woman (Eve), so this is a moot point. What a lovely name. I wish my parents had named me Mitochondrial. It is not yet late. you can still change your name to mitochondria. If humans came out of Africa, then why is it always when discussing the first Eve, that you picture the female to be White. Didn’t Whites came into existence thousands of years later? The Black woman carries the oldest gene in her DNA!! So just because she lived in Africa she was black? Dark pigmentation is a mutation and adaption that allowed people in that region to survive, but if the premises and demands back then were not the same as they are today, then there would be no need for them to be black. Black skin helps protect the skin against the sun, but at places where there is no such need this kind of thing has not been needed. I.E Eve probably wasn’t black. You all just cannot accept the fact that you originated from black africans. Why is that such a hard pill to swallow? I mean the article concludes that mitochondrial eve lived in Africa…but there’s a picture of a white lady in the beginning of the article?!?!? Yes she was very black.sorry to offend. Adam and Even didn’t exist at all. The Garden of Eden is a myth. One clue to that fact is that the story begins with a talking snake, which is physically impossible and thus makes the whole story as impossible as any other fairy tale with a talking animal. The Garden of Eden is no more true than the Three Little Pigs, Little Red Riding Hood, or Goldilocks and the Three Bears. I knew that the entire book of Genesis was a fairy tale the first time I heard it as a little girl. It amazes me that so many people don’t accept that. The human race evolved over hundreds of thousands of years from earlier primates and then hominids. The whole Bible is a compilation of myth and (violent) history and has held back human advancement ever since the Bronze Age patriarchs wrote it for their own selfish agenda. Thank you! I was wondering the same thing! Why can’t actual Black women be depicted BY A BLACK WOMAN???!!! Haahaaa, I was wondering the same thing about the white lady on the pic. I guess its the same reason why white Jesus was slapped on everything when we all know that Jesus was a man of color Smh. White cannot produce black due to their recessive genes but black women carry the DNA to produce all branches of humanity. Read up of the wide cases of Albinism in sub Sahara Africa and the migration of this gene mutation a all this begins to make sense. And just looking into the Melanin enriched people and we begin to understand the where we all come from. White comes from black!! Why is this so difficult for some white people to accept!! So when you say white comes from black that’s wrong. White comes from brownish, and black comes from brownish. However, you’re right about the depiction of Whitey Jesus, that’s bs. I have studies the Mitochondrial DNA for a little while… also, I have studied the effects of media and racism on the mind… I say this because Scientific Eve was from the continent we know of today as Africa… The lighter skin people did not show up for thousands of years later as people began to migrate north or east… Basically what I am saying is: Why is this article speaking of Mitochondrial DNA and speaking of Scientific Eve with a European white woman posted as the visual? @G: It’s from a famous painting of the Biblical Eve. There are TONS of Pictures of paintings or pictures of a black eve. Therefore, have the respect to use a pic of a woman of color. Whatever the woman in question looked like, the picture isn’t integral to the article, and if it was I certainly wouldn’t have picked anything with Biblical implications, but rather scientific. But, really, any picture would be every bit as arbitrary as this one, as who knows what said woman looked like physically? Did she have a large head and bulbous nose? Was she short relative to modern averages, perhaps due to malnutrition? Were humans at this point tan-colored, a la someone today from South Asia? Were they jet-black like many today from, say, Guinea Bissau? Or were they something in between? Were we still fairly hairy? Etc. If physical attributes were what the article was about, that would be very important to get right based on the current state of human knowledge about the answers to those questions. i like your articles, but the professor is exactly right, white folks have a real problem depicting Black folks in a positive light. the idea that color doesnt matter is an attempt by whites to obscure the fact that whites have made color an issue. bottom line you made a understandable mistake that you should learn from. the mother of us all should be pictured as she was, A BLACK WOMAN!! Subliminal messaging at its best. Remember White Jesus?? It took everybody decades to get that imagery out our minds and some still hold on that. It’s not a fact that “this gene” is only found in any particular type of person. Mitochondrial DNA is a section of DNA that is found in the mitochondria of every cell, rather than in the nucleus like most of the DNA. Every human has mitochondrial DNA in their cells. Mitochondrial DNA is only passed down by mothers to their children, not by fathers. I suspect this is where the misunderstanding arose. It might be irrelevant to you but there’s a title that says the mother of us all and huge picture of a white woman and that is completely incorrect. Be accurate in representing her likely appearance. There are surely many people who can’t accept that but it’s the truth. This is an interesting time lapse of where the country has gone since 2012. The new PC crowd is trying to archive their self righteous indignation… smh you all need a new hobby. If he included a picture of her likely appearance it would instantly be deemed more racist if you put a picture of a black woman up there looking de-evolved back towards our ape-like ancestors. How would that tickle you fancy? Would you guys like that? A black ape woman? Eff no, even though that is true and accurate you would be on here deriding it as blatant racism. You all, again, seriously need another hobby. ape like to you its how you perceive it and why a modern picture of a white women you know what people mean so stop being a smart arse. Way to say it brother! Too much real stuff going on in the world right now to be arguing about our DNA. Why all the whining about a picture, truth is no one knows what the first woman truly looked like, its certainly not provable yet to our science. She may well have had dark or skin, light skin or yellow skin or tan skin or olive skin, who knows. I would say this is picture is as apt as any, if someone else wants to write an article with black woman or a woman of any color it would be just as apt too. Need to wake up people, this woman may be mother to us all, and as such we all have the same right to call her mom. The picture is a distraction and a falsehood. We are all from one source. That source has already been founded to be of and out of Africa. Well I most certainly don’t trust their “conclusions” and “questamations” about the time in which Adam and Eve lived especially considering we do not know how long Adam lived before Eve was created, nor do we know how long Adam and Eve lived, before they sinned. (When they sinned their days became numbered). As for me – from a bible believing perspective, if God said it, I believe it, and that settles it. Well according to my knowledge the garden of Eden was in north Africa (this before the land was divided) and Eve would have been at the very least a familial match to Adam as she was created from Adams rib. We evolved I am sure to cope with our emvironments… someone that settled in Scandanavia would not need the same amount of melamien production as someone who settled on the borders of the sahara dessert. No such thing as the garden of Eden or Adam or Eve, but good try. This should not even require genetic testing, because the nature of the infrastructure should say it all. It should be evident to all and sundry, that the head on the Great Sphinx of Giza is clearly that of an African woman; a black woman. And please don’t try telling me that the white man was first but he opted not to pervert history when he did exactly that by painting white images of Jesus, who according to all the scriptures could only have been a black man; (hair like wool and feet the color of burned brass). Say it again Clarence !!! The indoctrinated who coddle themselves by saying ‘no one knows’ ‘settled at the BOTTOM (?) of the world’, even though they claim to have read an article and comments afterwards which site scientific evidence, easily found in-depth elsewhere & understood by intelligent souls, decades-long research the minds of worldwide scholars brought to light. YOUR lack of melanin shows when whitewashed comments expose how ‘devolution’ is paramount among those who refuse or excuse multitudes of evidence scientifically linking our original community to 10,000 or fewer individuals. African ancestors isn’t specific enough when determining 1st modern human DNA, which are not Black Africans but the ‘Bushmen’ aka Sans people. Pygmies of Africa, who tend to be black and look like their Bantu-speaking neighbors but are small & closest kin to the San people. Proving, once again, why many still harbor repressed fear of a scientifically proven superior DNA. Don’t believe me? Do what you should have done before exposing your weaknesses. Knowledge is Power. Critical thinking should be employed when discovering why people without gene SLC24A5 mutations, the melanin gene, are abducted for organ harvest – hint, hint. Or why African DNA-dominant organs have better success rates. Refer to Spencer Wells, director of the Genographic Project, Deep Ancestry, NatGeo Society 2006 – “African populations are the most genetically diverse on the planet”. Using critical thinking, you will realize how West African Coast/sugar plantation-induced slavery played an unnatural role in diversifying African DNA at a rapid rate for 400 years. Still think we are all the same? Or do you think we should all Act the same? While sayings ‘we are all alike’ or ‘white people’ or ‘black people’ may have some truth depending on context, are ignorantly grouped in absolute terms. DNA reproduces and recombines generation to generation, but our individual destinies all sprung from the sands of Africa. I’ve been called ‘white’, American & made to define myself as caucasian. Why do I grimace when addressed as ANY of these terms??? The term ‘Caucasian’ geographically refers to peoples living along the Caucasus Mountains. Why was taught pride in checking that box? My Mother, Aunt and I traced the maternal side of family tree branch. Both my Aunt and Mother received reservation cards after proving Native American Indian heritage, even found an Indian Princess along the way. We also traced roots back to Ireland and the ship carrying my ancestors. So if you ever ask if I’m proud to be American…buckle up!!! Hope you know the true history of slavery, segregation and evil. I educated myself on who defaced the Egyptian faces and why. Bull crap. If skin color doesn’t matter post our Original,Black, Mother Earth. I will be so glad when people will be able to get over the fact that a “black woman” is the mother of all life here on earth. I’m so sorry that many people’s feelings may be hurt by this but science is science. I love my heritage and can’t believe the masses want to cover this up in many ways to lessen our importance on this earth. All races came from us black woman. We carry the gene to create all the races and I’m proud of that. Which stately old English manor would that be? The one where they have good MANNERS, I trust? I personally find it incredulous, how defensive people can get when science proves something and it in return effects their ancestry .Oh my, we came from them. We aren’t the superior race anymore. Yeah, boy. Offspring from Blacks. Mass suicides. What ever will the KKK think??? Pretty sure the human race is still superior on this rock. 😉 The problem is the whole idea of different “races” being divided by color of skin or other such similarly arbitrary things. That makes no sense at all. Might as well make a divider by eye or hair color combinations. 🙂 Genetically, the difference between every human alive today is almost nothing. And, as this article points out, we’re all much more closely related than people seem to think. The audacity of the author to miss -represent the true Mother of creation , the Black Woman. Those with contemp in their hearts, hate the truth of their existance. She is the most disrespected Woman to the point that those who hate the truth, will pervert her image with a recessive female making love to kudulini spirit. Yes this is spiral warfare .We know what you are trying to pull. BTW, The Black Woman was never a monkey . She is a true human!She is the true alpha and omega. Those who don’t believe are in for a rude awakening. It’s disappointing to see what the comments section has become, trying to make this entire post about skin color. I guess the popular thing to do these days though, to make up some issue, blow it out of proportion, then blame white Christian males for causing all of the world’s problems. I would like to point out that even if Jesus wasn’t white, he wouldn’t have been black either. He was from the area of the world we call the middle east, and it doesn’t take much more than a google search to realize that people from that area look much more European or “white” than they do African or “black”. Some more food for thought: If there is no God and evolution is completely true, and the first humans were in fact black, and white people didn’t appear until tens or hundres of thousands of years later… wouldn’t that mean white people are a more evolved form of human than black people? You may now begin your ad hominem attacks, crying racisism rather than addressing my argument. The people of that time didn’t look like what the people who reside there now do. There is no such continent or country called the Middle East it is part of Africa. A 1000 yrs from now people will be able to say the same thing about America. “Well if you do a Google search you will see that the people in this area are mostly white. Which we all know white people weren’t the first people in America. so I guess, to sum up, this ….”discussion” …. all white people are black and all black people are white….and we should give a shader effect tool for the picture, so everybody can shade the picture to their liking….. or maybe put 23 pictures of the same in deferent shades. the point of this is dna…or mtDNA…… and we are …they are talking theories. Lol! Wow! The comments pretty much sum up the problems of the world today. Jeez! I have also heard that the Jewish people were originally black. That would make Jesus a much darker shade than white. I have also read about white people originating from albinos who were cast out of their tribe/clan. This could be the root of so many white people not accepting the black skinned research. I don’t know because I am not a scientist. But I have come to conclusion that humankind is all people. You have different shades and sizes. Different features. But so do dogs and cats and birds…. get over it. It’s silly to analyze this article by only a famous picture, which is an artist’s depiction of how he visioned Eve’ s appearance. The article. Stick to the article. Move on! Learn and retain it. Don’t be so critical over a picture. If it’s the picture, take it up with the artist… well, most likely they are no longer with us. And if that is the case, It was most likely an Italian painter. Hello? Romans? Catholics? The first Christians? The ones who made women 2nd class citizens? At a time when people, in general, only knew their surroundings. People dis not have radio, tv, internet, cars trains or airplanes. It’s not that hard to figure out.